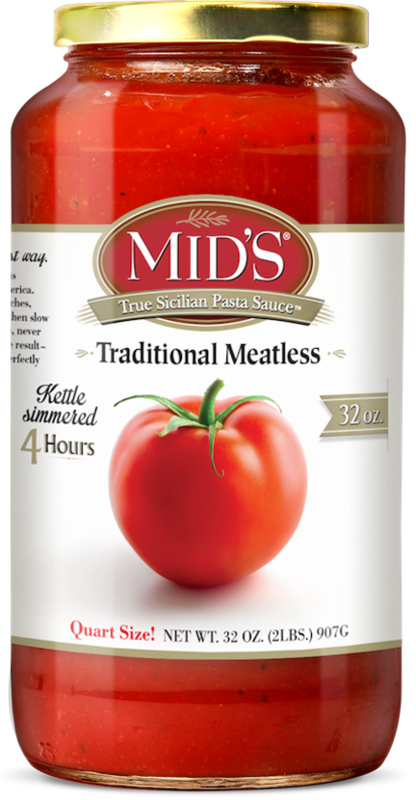 A classic true Sicilian red sauce, Mid’s Traditional Meatless sauce is hand-crafted using simple, all-natural ingredients like vine-ripe California tomatoes, spices from all over the world, pure Pecorino Romano cheese and imported Italian olive oil. It’s the same recipe, same quality ingredients, and same cooking method Mideo perfected more than 70 years ago. Our Traditional Meatless sauce is a hearty, fill-the-house-with-aroma sauce, perfect for spaghetti, lasagna or any pasta dish. And, make sure to try gluten-free Traditional Meatless sauce as a savory dipping sauce for mozzarella sticks, bread sticks, pepperoni rolls and other snacks and appetizers. Ingredients: Water, Tomato Paste, Sugar, Olive Oil, Salt, Onions, Romano Cheese (Made From 100% Pasteurized Sheep’s Milk, Bacterial Culture, Salt, Rennet), Garlic, Citric Acid, Spices, Paprika.